Tree Profile for the Hungarian Oak - Urban Forest Nursery, Inc.
Because the mighty oaks grow nearly all over the world, we will continue to see new introductions from Quercus for a long time, to add to that awesome group of urban trees. 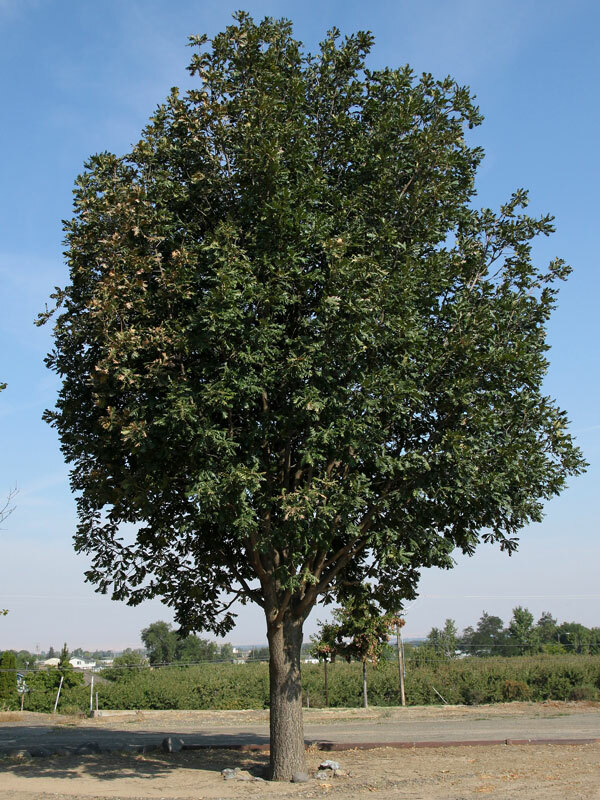 The Hungarian oak, quercus frainetto, is one of the more recent introductions (30 years ago) in North America. Originally native to the mountainous regions of the Balkans, this tree can get very large, over 100 feet tall. What strikes you first are the long, large and nearly perfect round lobed leaves throughout the tree. The shiny rich green leaves are broadest above the center and can easily reach 10” long by 5” wide. There are at least 2 cultivars, ‘Schmidt’ Forest Green selected for their unique, but, in my opinion, subtle differences. ‘Schmidt’ Forest Green is known for its regular manner of growth and well closed or dense leaf cover. Trump is said to be distinguished by a steeper more uniform manner of growth. I suspect in either cultivar, you will find and be delighted with its most obvious characteristics, its large bold character and shiny bright leaves. This is a fairly fast growing tree with branch angles at about 45 degrees. Young twigs are thick, hairy and olive light green, older twigs, more gray. The trunk bark is also gray, and with age the bark flakes off in platelets. This is a tree you want to watch through the fall. Early on, leaves turn yellow from the edges, leaving a flush of green along the major veins. Then before you know it, the whole leaf is a dark golden bronze color. Leaves appear to cling to the twigs for the early winter but then fall as the temperature drops. The acorns are one third to half enclosed by the capsule. Both leaves and acorns are very characteristic to the species. The Hungarian oak is said to be drought tolerant. It appears to transplant easily and have no significant disease or insect problems. As we look for trees with large canopies for our parks, boulevards and large open spaces, keep the Hungarian oak in mind in your ever expanding tree palette. Please let me know any experiences you have had with this tree.